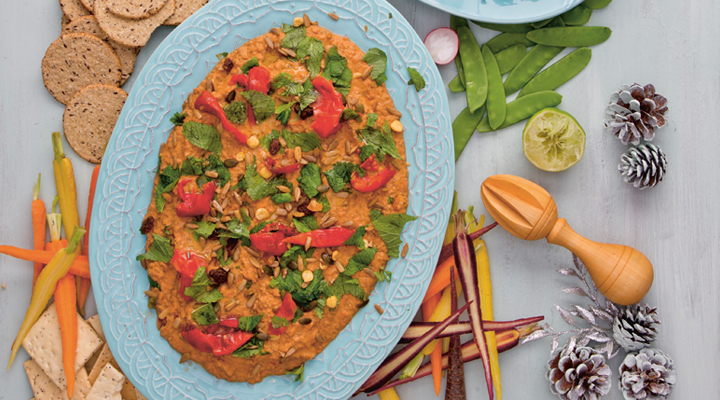 This no-cook, protein-rich dip is great to serve with leftover raw vegetables, crusty breads or even fancy crisps. Put the lentils in the bowl of a food processor with three-quarters of the tomatoes, including their oil. Reserve the rest of the tomatoes for serving. Add the lime zest and juice and the curry paste and almond butter, then blitz until smooth. The dip can be kept in a sealed glass jar in the fridge for up to three days. To serve, spread on a large platter. Top with the remaining tomatoes and the chopped fresh mint, seed mix and a good drizzle of olive oil.